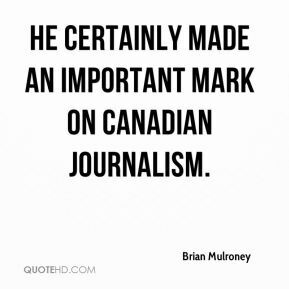 He certainly made an important mark on Canadian journalism. 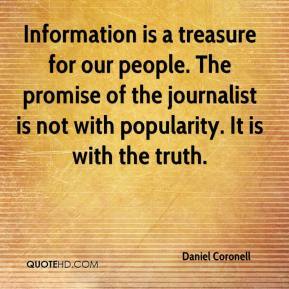 I viewed him as a highly principled journalist with well developed views on the world. He was unafraid to assert them and, of course, to defend them. It doesn't mean that you endorse it. 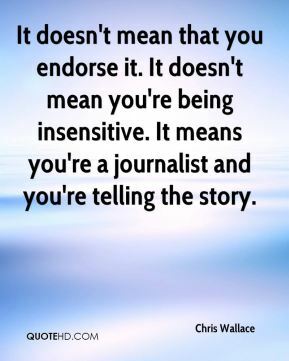 It doesn't mean you're being insensitive. 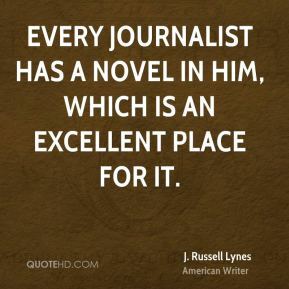 It means you're a journalist and you're telling the story. 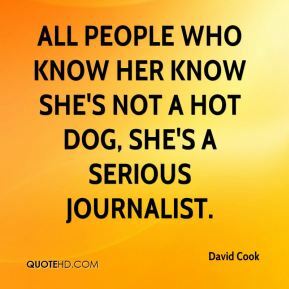 All people who know her know she's not a hot dog, she's a serious journalist. 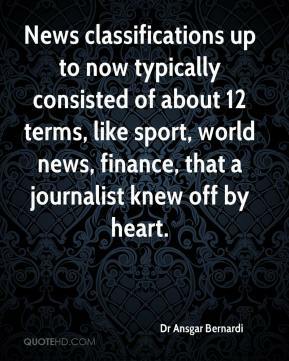 News classifications up to now typically consisted of about 12 terms, like sport, world news, finance, that a journalist knew off by heart. Mike brings us a deep reservoir of knowledge in politics, regulatory and financial affairs. 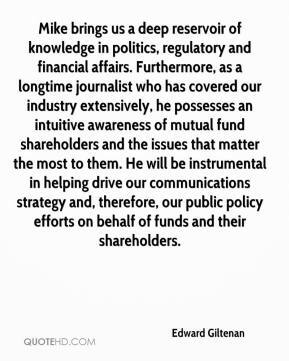 Furthermore, as a longtime journalist who has covered our industry extensively, he possesses an intuitive awareness of mutual fund shareholders and the issues that matter the most to them. He will be instrumental in helping drive our communications strategy and, therefore, our public policy efforts on behalf of funds and their shareholders. 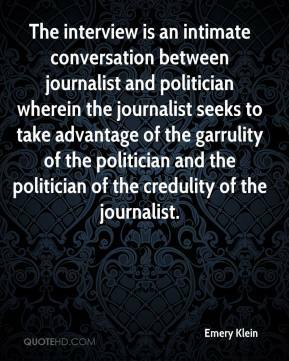 The interview is an intimate conversation between journalist and politician wherein the journalist seeks to take advantage of the garrulity of the politician and the politician of the credulity of the journalist. 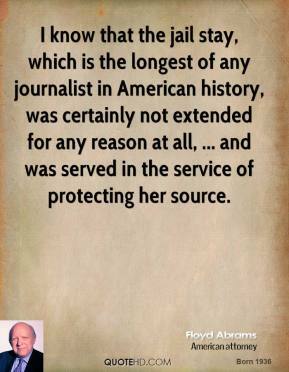 I know that the jail stay, which is the longest of any journalist in American history, was certainly not extended for any reason at all, ... and was served in the service of protecting her source. 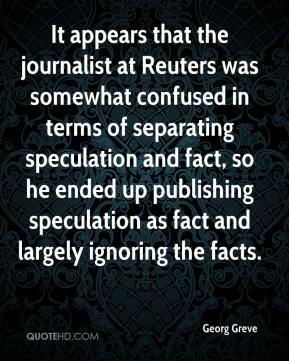 It appears that the journalist at Reuters was somewhat confused in terms of separating speculation and fact, so he ended up publishing speculation as fact and largely ignoring the facts. 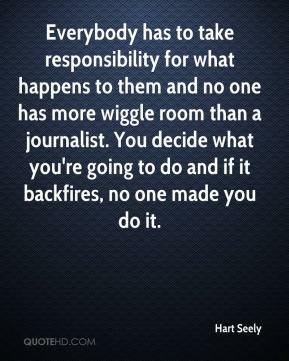 Everybody has to take responsibility for what happens to them and no one has more wiggle room than a journalist. You decide what you're going to do and if it backfires, no one made you do it. 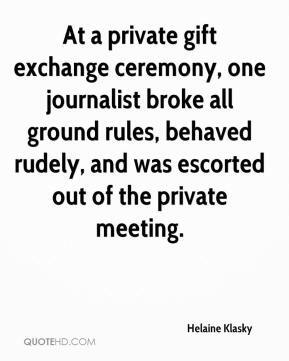 At a private gift exchange ceremony, one journalist broke all ground rules, behaved rudely, and was escorted out of the private meeting. 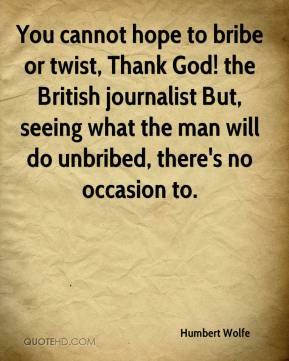 You cannot hope to bribe or twist, Thank God! 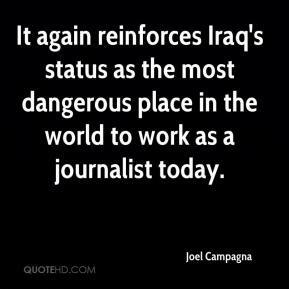 the British journalist But, seeing what the man will do unbribed, there's no occasion to. 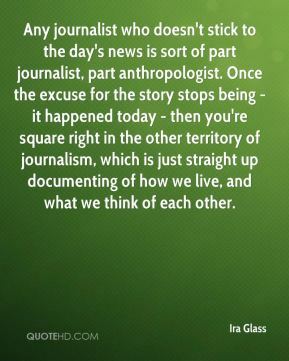 Any journalist who doesn't stick to the day's news is sort of part journalist, part anthropologist. Once the excuse for the story stops being - it happened today - then you're square right in the other territory of journalism, which is just straight up documenting of how we live, and what we think of each other. 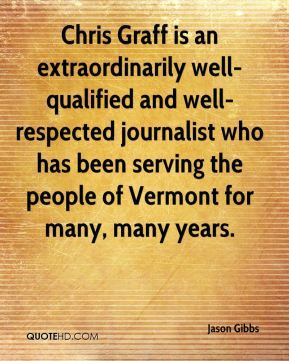 Chris Graff is an extraordinarily well-qualified and well-respected journalist who has been serving the people of Vermont for many, many years. 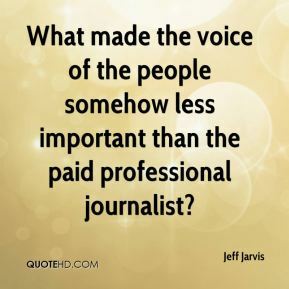 What made the voice of the people somehow less important than the paid professional journalist? 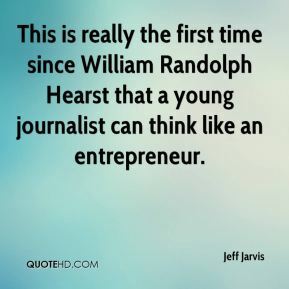 This is really the first time since William Randolph Hearst that a young journalist can think like an entrepreneur. The Republican candidate has strong name ID. She's run in the district before. 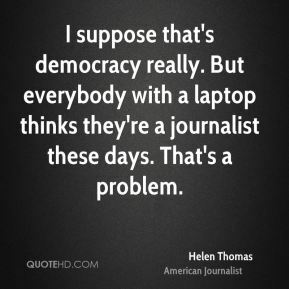 She's an Emmy-winning television journalist. 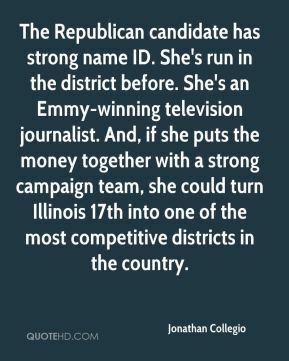 And, if she puts the money together with a strong campaign team, she could turn Illinois 17th into one of the most competitive districts in the country. 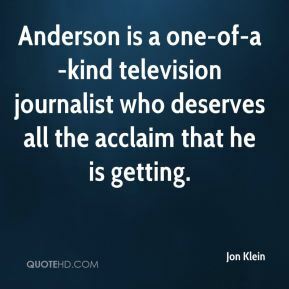 Anderson is a one-of-a-kind television journalist who deserves all the acclaim that he is getting. 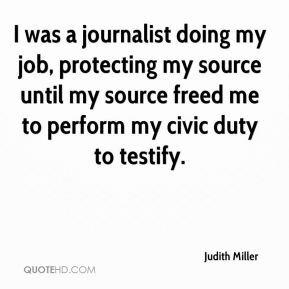 I was a journalist doing my job, protecting my source until my source freed me to perform my civic duty to testify. 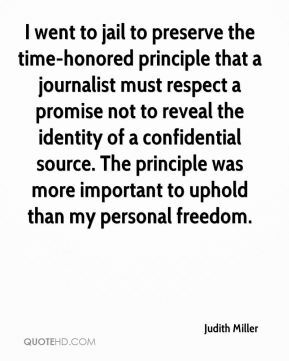 I went to jail to preserve the time-honored principle that a journalist must respect a promise not to reveal the identity of a confidential source. The principle was more important to uphold than my personal freedom. As an award-winning journalist and media professional, Mike possesses the knowledge, skills and experience to provide clients with solid counsel on how best to deliver content to newsrooms and across other media platforms. 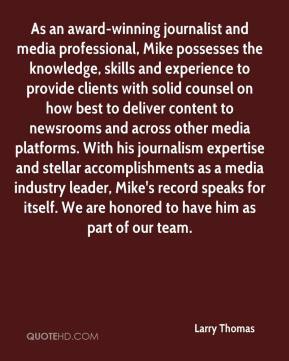 With his journalism expertise and stellar accomplishments as a media industry leader, Mike's record speaks for itself. We are honored to have him as part of our team. 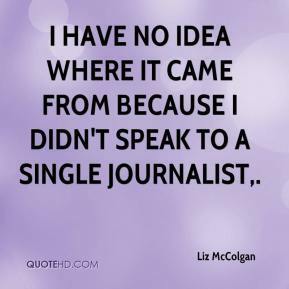 I have no idea where it came from because I didn't speak to a single journalist.